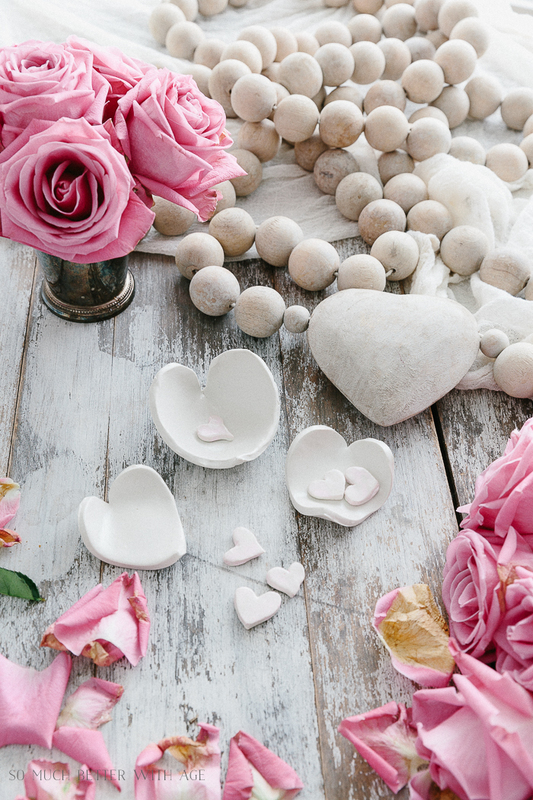 Give your Valentine an adorable clay heart dish for Valentine’s Day this year and they’ll be able to keep it forever. Making some memorable items with clay is fun. Making them into something practical is even better! 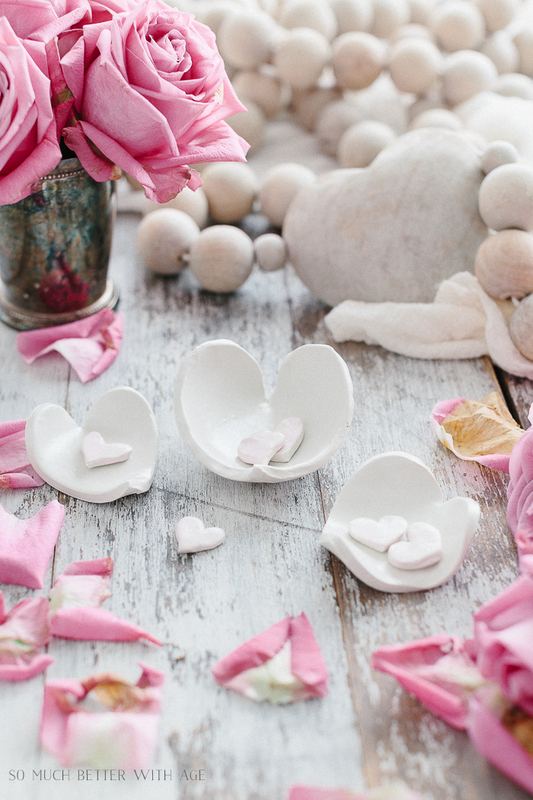 I love these clay heart dishes for keeping rings in or change. 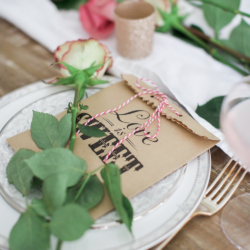 Add some Valentine’s candy to them and wrap them with a bow for your Valentine this year. Today I’m joining a Very Vintage Valentine tour hosted by my friend Summer of Summer Adams. 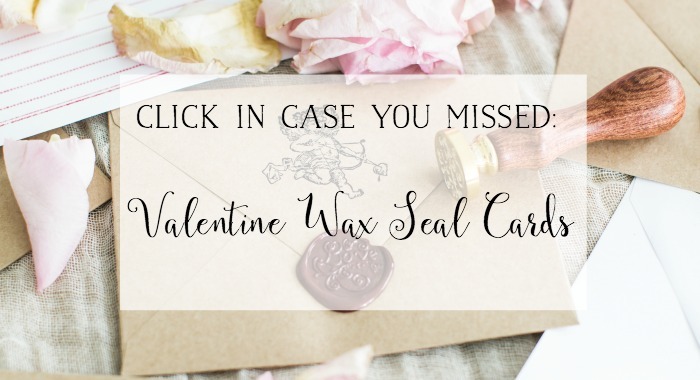 Be sure to visit the other vintage Valentines at the bottom of this post. 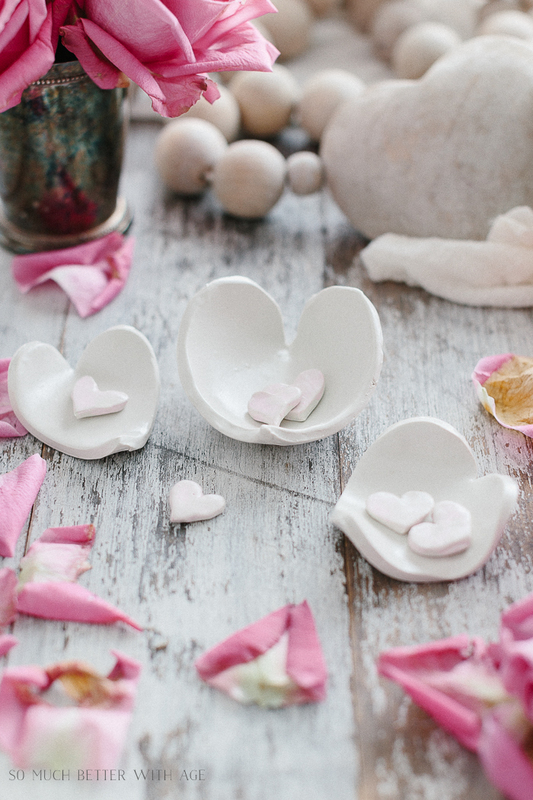 Here is what you’ll need to make these adorable clay heart dishes. 1. Heat the oven according to the directions (I set my oven to 275 deg F). 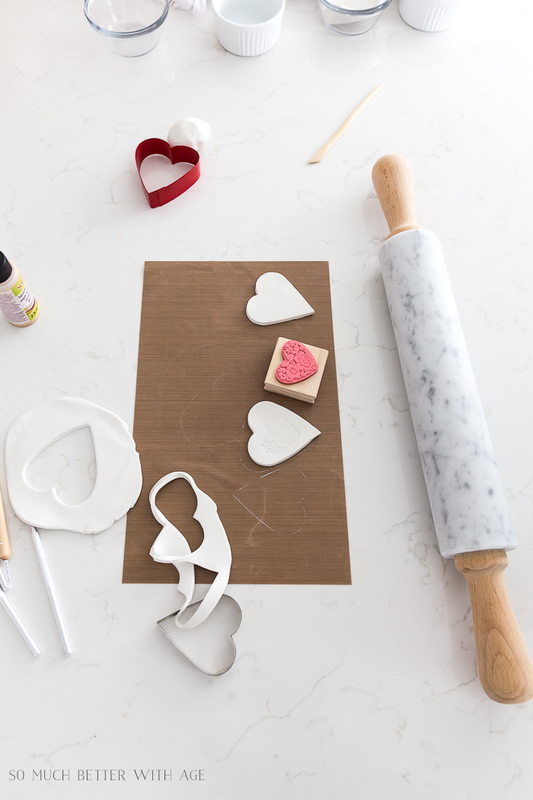 Knead the clay in your hands to warm up. I put the clay on a warm part on top of the stove to get it started. Make sure it is free from plastic. 2. 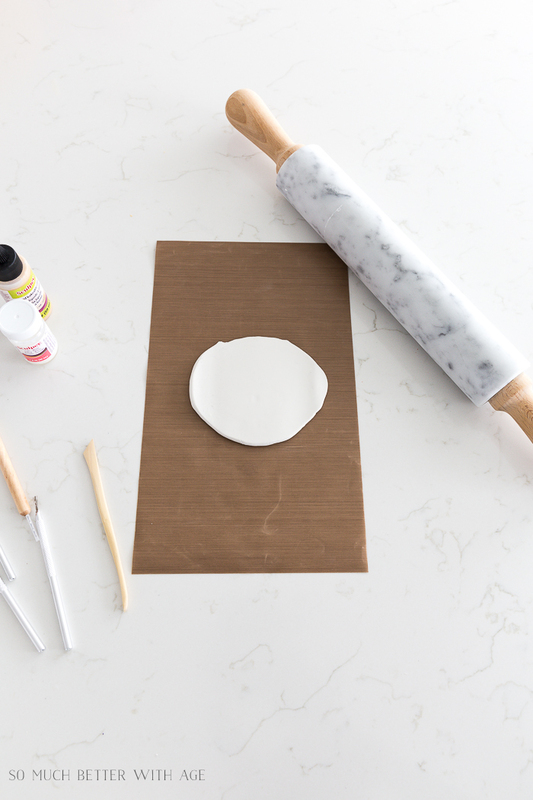 Roll out the clay on parchment paper or a work and bake clay mat. 3. Freehand a heart shape into the clay with a tool. When you have the shape you want, put the tool all the way through to cut out the shape. 3. Smooth out the edges by rubbing them with your fingers. 4. 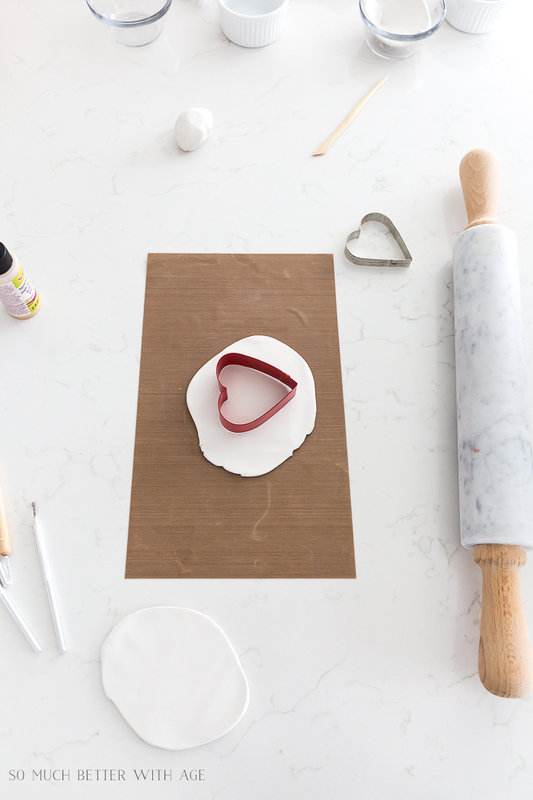 Place the heart in a small ovenproof bowl like a ramekin or a bowl with an angled edge. Tip: you can also use a cookie cutter to cut out your heart! 5. 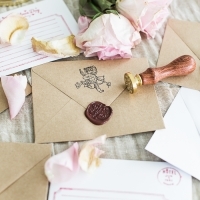 Use stamps for adding an intricate design. 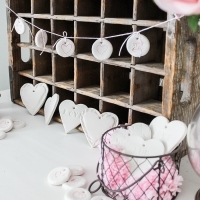 You can also use lace or doilies like in these clay hearts I made years ago. 6. 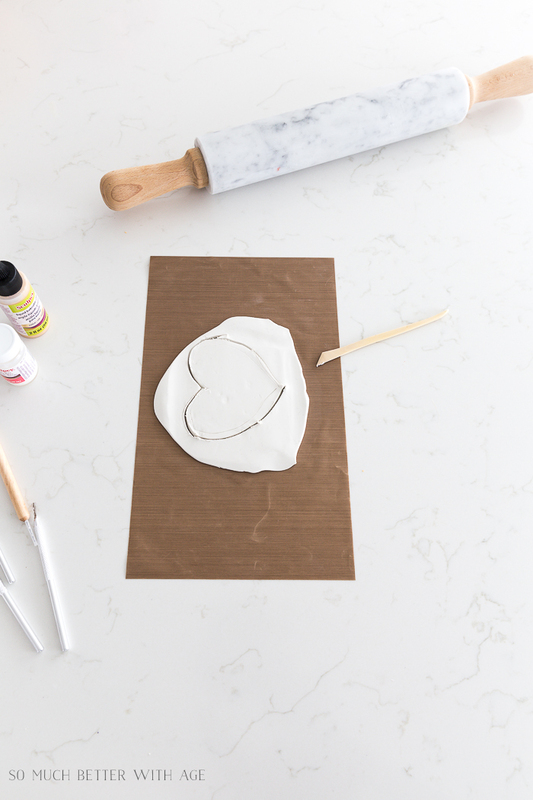 Cut out some mini hearts to add some to your heart dish and to use the rest of the clay. 7. Bake in oven for 30 minutes. Allow to cool completely. 8. 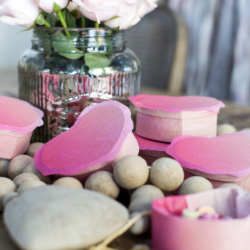 With a glaze mixture of one part pink acrylic craft paint and one part water, brush over the mini hearts and allow to dry. 9. 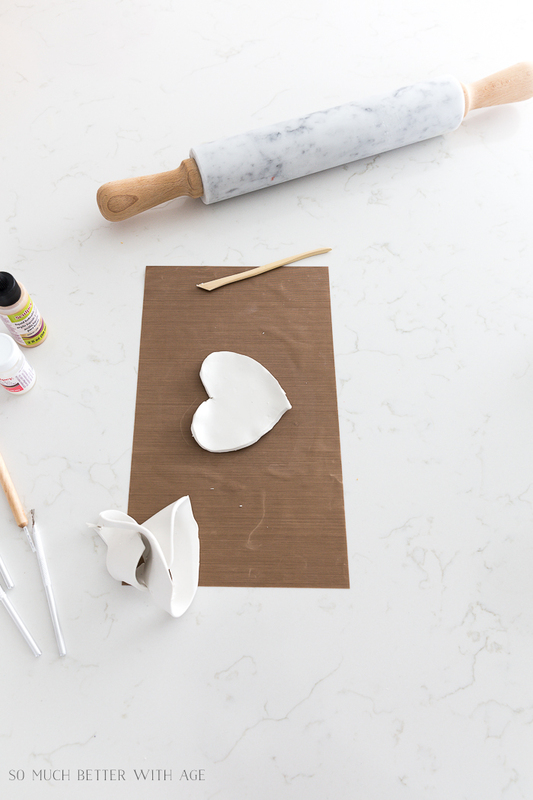 Rub paint into the hearts with intricate details like the ones below. 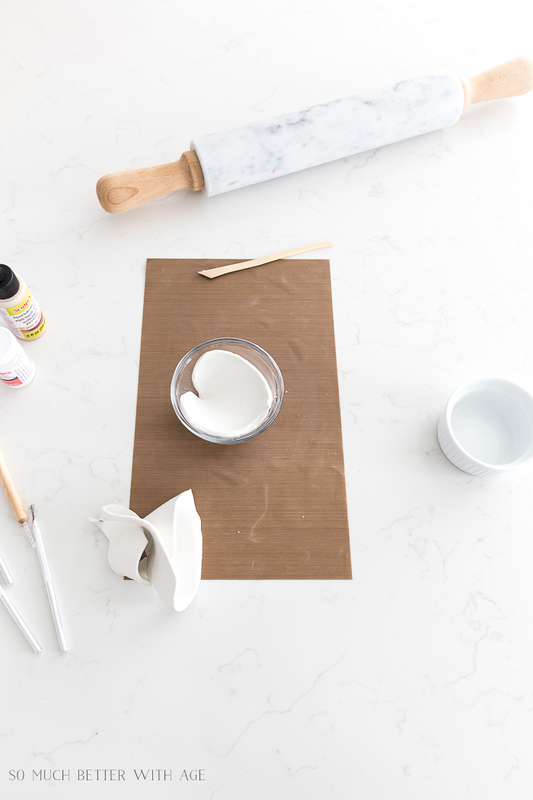 Brush on a gold paint and wipe off with paper towel. Allow to dry completely. 10. 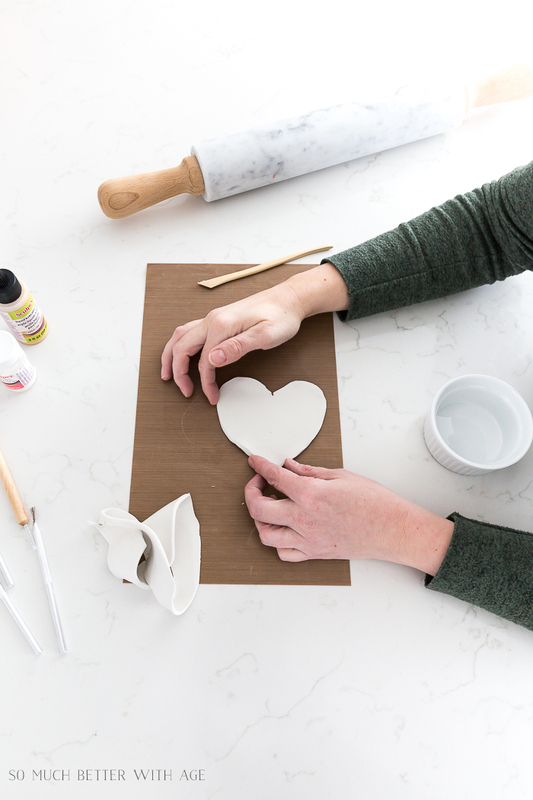 Brush satin glaze over top of all the clay hearts to give it a finished pottery look. Allow to dry. I love how they turned out! 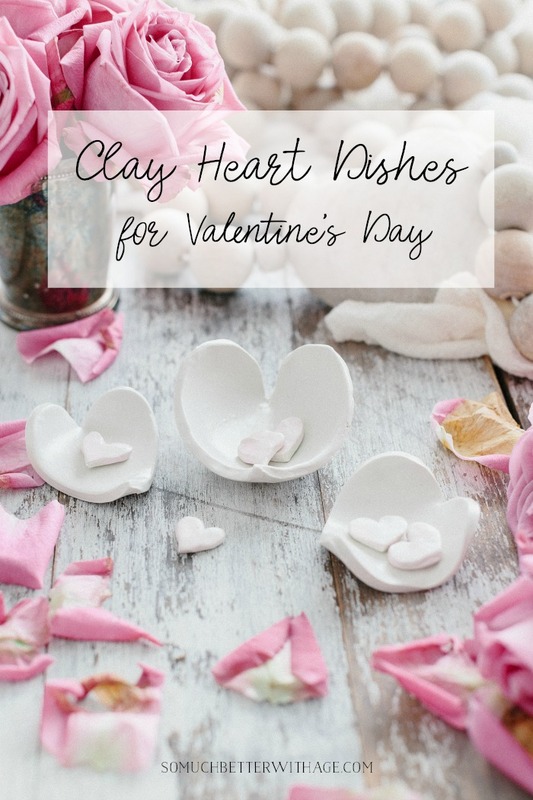 I hope this has inspired you to make your own clay heart dishes for Valentine’s Day. 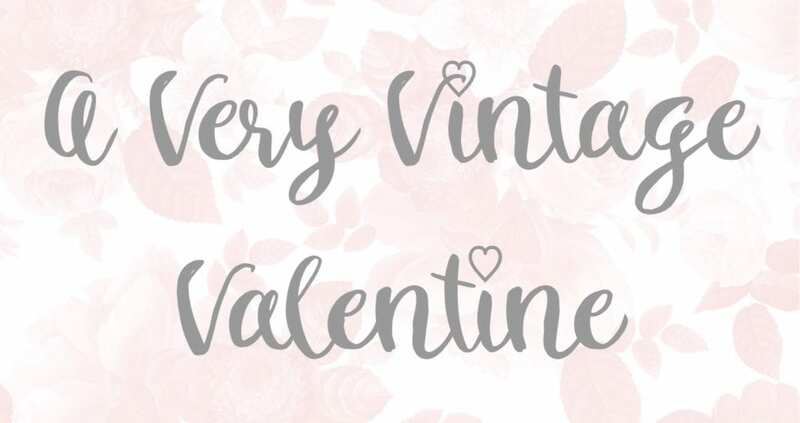 Now be sure to visit my friends below for their Vintage Valentine projects. Please make sure to visit my other friends who are joining me today! Oh my gosh, these are absolutely adorable Jamie! 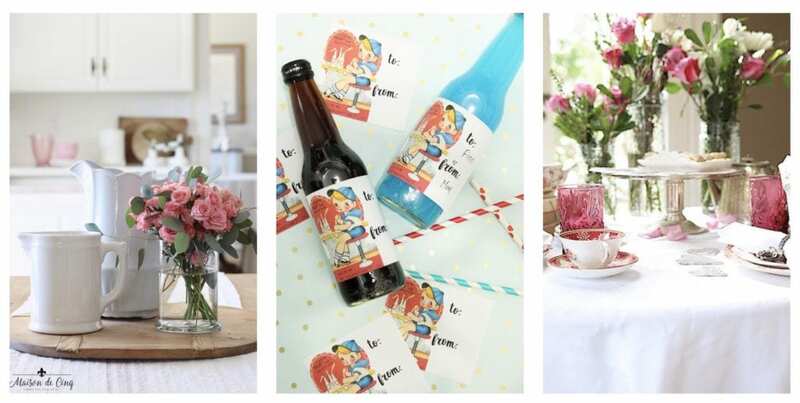 You are always so creative and these are such a cute idea! Jamie! 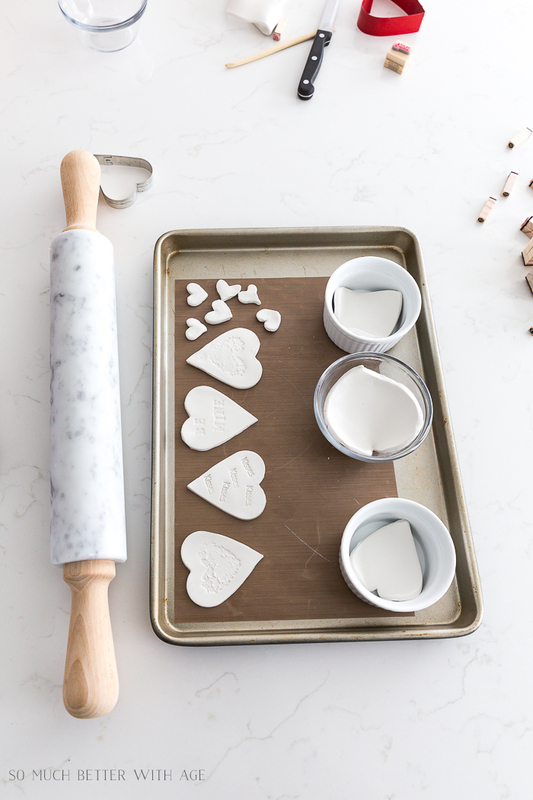 These are the sweetest little dishes ever! 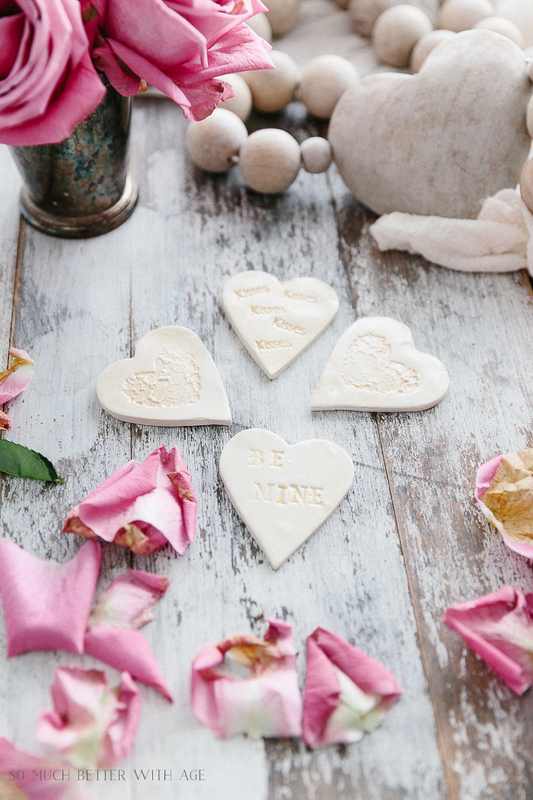 I’m definitely going to make these for my sweet Mother, 3 sisters and darling daughter for Valentine’s Day…and me too! I have the twin to your heart stamp, I love it. Thanks for sharing your creative genius. Aww, thanks Judy! They are so fun and easy to make. Have fun! WOW! What an adorable idea Jamie! You are so crafty and creative! 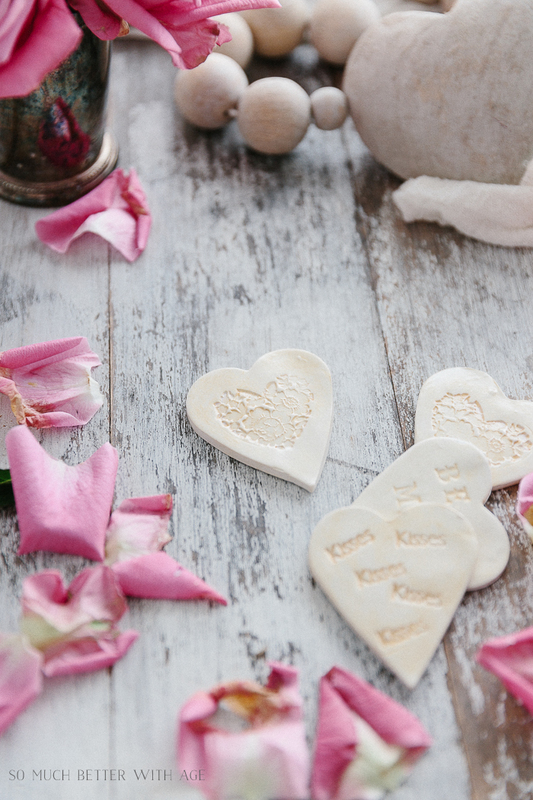 We love these little clay hearts! Thanks so much, Kim & Lacey! They were so much fun to create. HI, Jamie! Beautiful hearts! Where did you get the string of wooden beads and heart? I got it at the Shabby Chic Couture store in Santa Monica. I know they also sell it at The Cross online. Hope that helps! 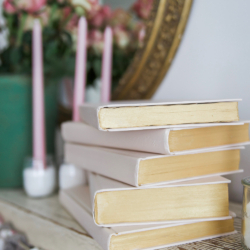 Hi Jamie, I just discovered your blog from Miss Mustard’s Seed. You have an amazing blog and I just signed up for your mailing list 🙂 Looking forward to more of your amazing ideas. I would also love to know where you found your wooden beads with the heart. Hi Michelle, thank you so much and I’m so happy you’re here! I bought those beads at the Shabby Chic Couture store in Santa Monica but I know that The Cross has them online too. Have a beautiful and Happy Valentine’s Day! 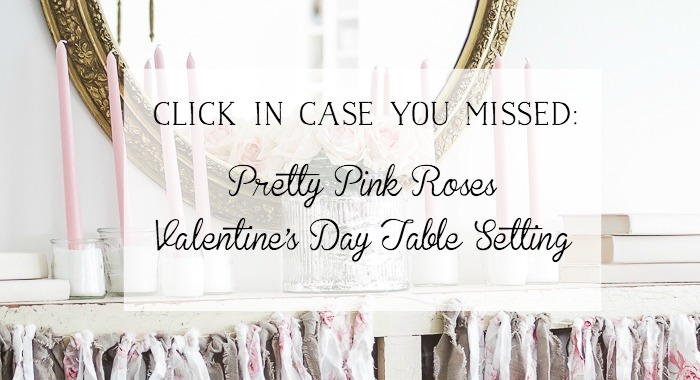 Thanks so much for the feature, Amber! I love your parties.